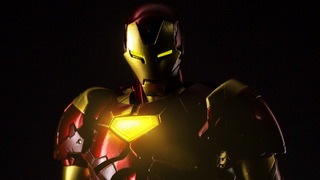 Yesterday we got a brief tease of Sentinel's latest Iron Man 'Re:Edit' figure, alongside their snazzy upcoming Hulkbuster toy - but now the company has released a full set of pictures showing off the Extremis Iron Man figure, and it's looking rather fabulous. And glowy! Very glowy. The 18cm figure is based on the Extremis armour from the comics, which is a bit more angular than some of the more traditionally smoothed-edge Iron Man suits of the modern era, but Sentinel's toy really plays up the angular edges on things like the chest and Iron Man's helmet. It might not be as smooth-lined a suit as their Bleeding Edge figure, but it's still quite a looker. Also, articulated enough that Iron Man can be swish as hell, judging by this splendid 'Are you not entertained?' pose he's cutting. Alas, such a gorgeous figure does not come cheaply - by which I mean, holy crap, when the Re:Edit Extremis hits stores in May, it'll set you back $170. That's a lot, especially for a smaller than 1:6 scale figure. But it is pretty. So pretty.